When an old piano is out of tune and completely out of commission, some say there’s only one thing left to do: Burn it. Burning an old piano has become something of a tradition for musicians and Air Force members alike—although no one's exactly sure how it got started. Most stories attribute the birth of the custom to the British Royal Air Force (RAF), with the ritual eventually spreading to the U.S. Air Force. One popular origin tale goes like this: Some time during World War II, the Royal Air Force decided that their pilots needed to be more civilized and gentlemanly. As part of this etiquette training, pilots were required to take piano lessons. 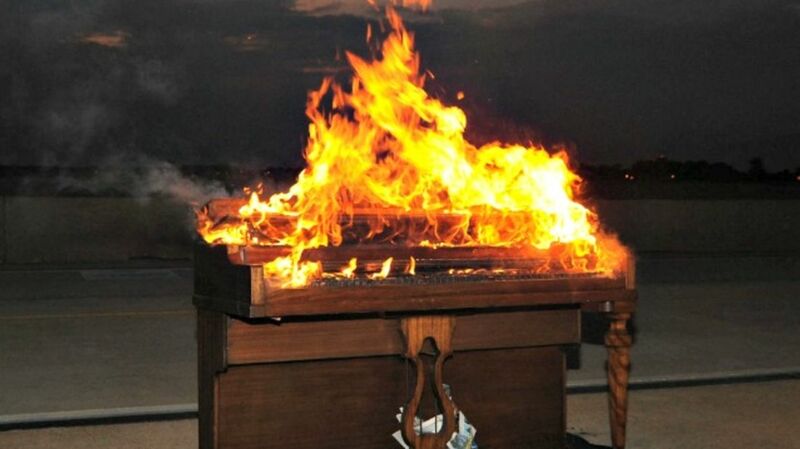 And they all hated it—so no one was surprised when the building the piano was in mysteriously caught fire, reducing the instrument to a pile of ashes, strings, and keys. The act of rebellion quickly became a tradition among pilots. The other story often cited is a bit more touching. By this account, a fallen RAF fighter pilot was also the resident piano player in his squadron, and after he was killed on a mission, his fellow squadron members burned the piano in his honor—if he couldn’t play it, no one should. But it’s not just members of the military who tickle the incendiary ivories—playing a piano as it burns has also become a kind of performance art. Pianist Yosuke Yamashita played his first burning piano in 1973, when a graphic designer asked him to do the honors for a short film. Yamashita happened to view the film again 35 years later and was inspired to do an encore performance. This time, he assembled 500 spectators on a beach in Japan's Ishikawa Prefecture to watch the piano turn to embers. It took 10 minutes for the flames to completely silence the instrument, but Yamashita played until he could literally play no more. "I did not think I was risking my life but I was almost suffocating from the smoke that was continuously getting into my eyes and nose," Yamashita later said. - Set upright piano (not a grand) in an open space with the lid closed. - Spill a little lighter fluid on a twist of paper and place inside, near the pedals. - Balloons may be stapled to the piano. - Play whatever pleases you for as long as you can. If you do follow her instructions, however, make sure you adhere to Lockwood's number one rule: "All pianos used should already be beyond repair."